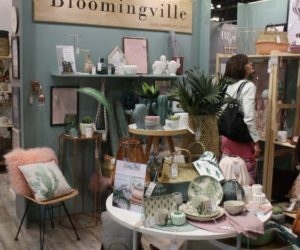 Now in its seventh year, Boutique Design New York (BDNY) attracts a large crowd of professionals serving the hospitality industry. 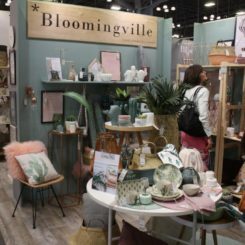 Homedit ventured to New York City to see what manufacturers and marketers of high-caliber design elements for hospitality interiors are showing that could be part of your home’s decor, or at least inspire ideas for upgrading your space. 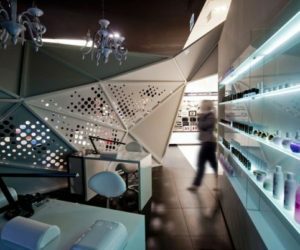 While many of the vendors specialize in the hospitality industry, most have a retail arm, or work with designers on residential projects. 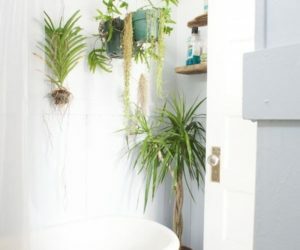 Here are some of the things we found that would be great additions to any home. 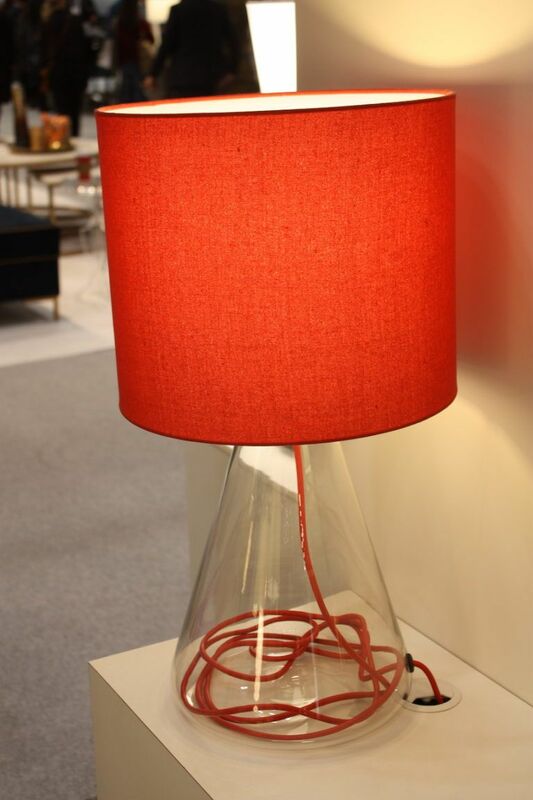 Sunning in red, the silk cocoon fixtures are also available in a natural color. The raised pattern is almost like embroidery. 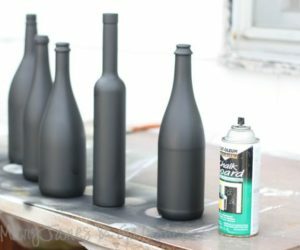 A series of topcoat pendants is simply a lot of fun. These pieces look great together. 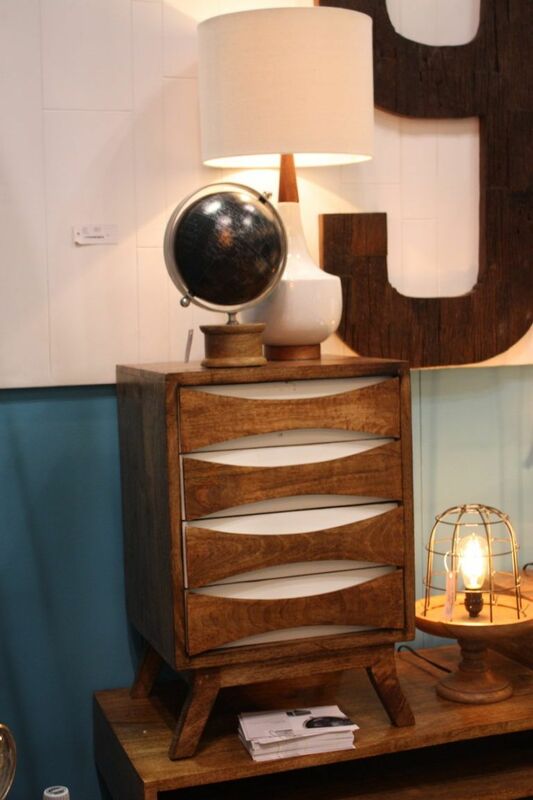 This is perfect for a modern or rustic space. 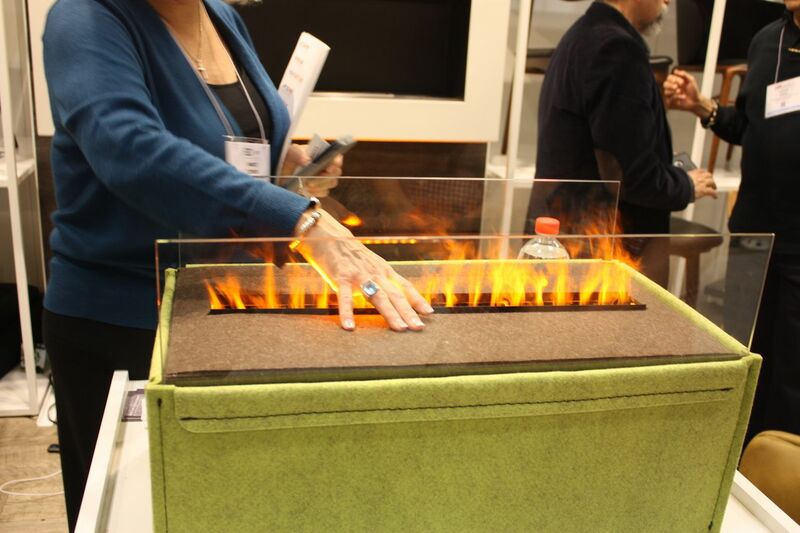 Perfect for any room in the house, this fire is only water vapor. 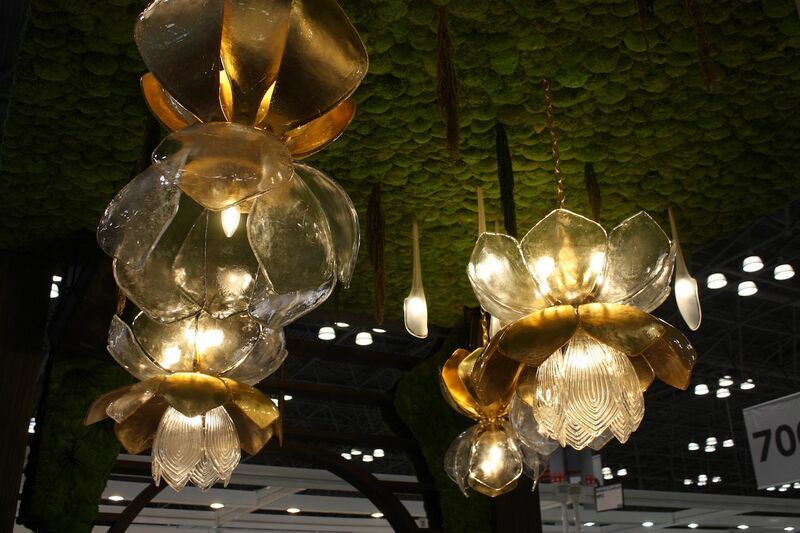 The fixtures are large and enchanting. Tall, colorful and throne-like, these dining chairs are vibrant and special. 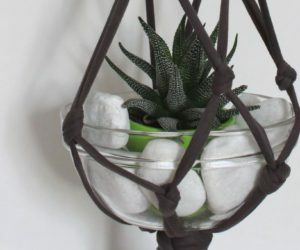 Pretty and practical, these pieces can withstand the elements. Small and spare, in a large group they make quite an impression. 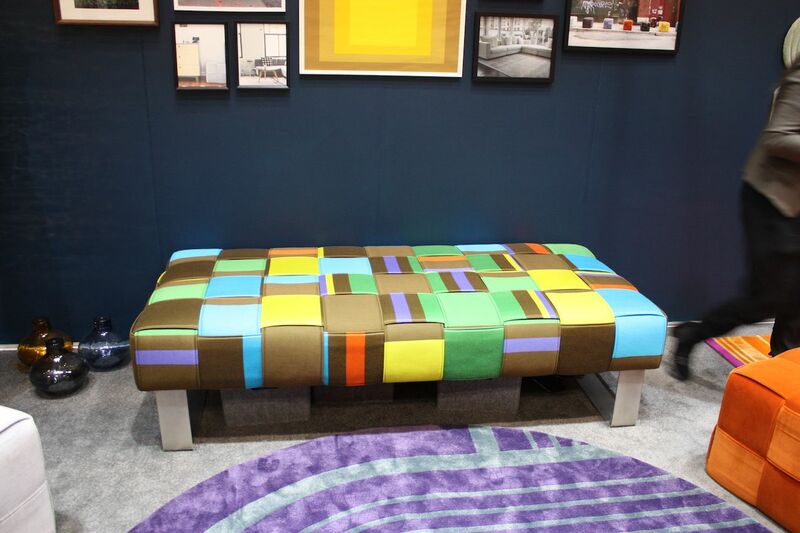 Tutu uses vibrant colors in her benches, stools and rugs. 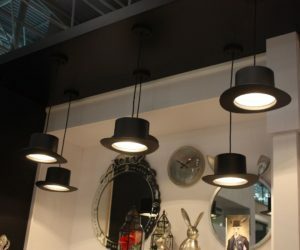 The car-parts-come-pendants are available in different metric finishes. 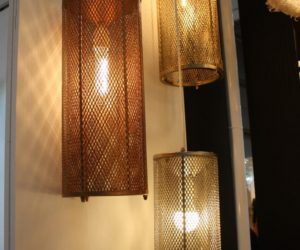 There was plenty of lighting to see and we found some new brands and pieces that we just had to show you. 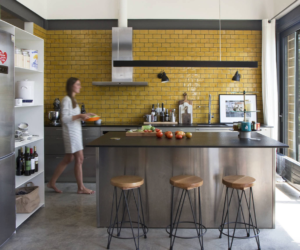 From vintage-looking fixtures from Italy to modern works produced in the United States, these are just the right pieces to source up your space. 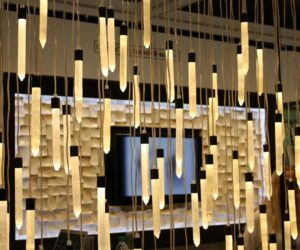 This array of slim and lovely lights from Cravt Original reminds us of icicles or stalactites and while they would be lovely in a smaller burn, this mass of them is gorgeous. 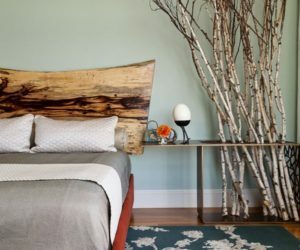 A cool modern table lamp like this one from Chapman Manufacturing adds a bring pop of color but is light in feeling thanks to the clear glass base. We also love hoe the cord becomes a design element in this piece. The colored cord adds interest. 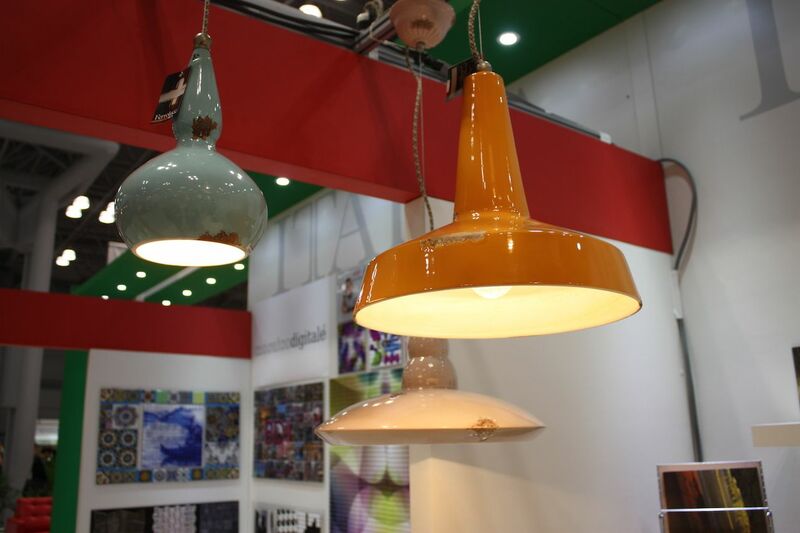 Ferroluce of Italy presented new designs that have a distinctively vintage feel. 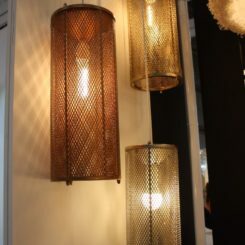 The industrial distressed look of these pendants carried over to table lamps that look like old-fashioned lanterns. Gentle distressed details keep the colorful pieces in the vintage realm. 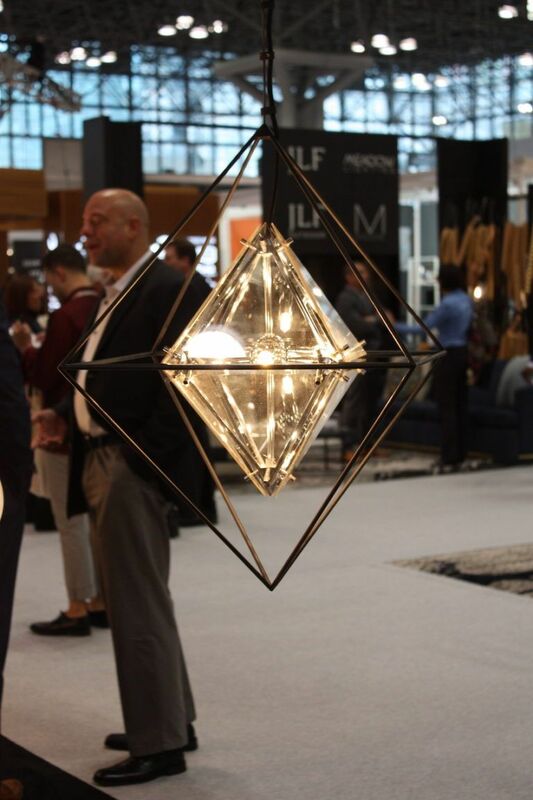 Hubbardton Forge showed the new Divergence Outdoor Living Pendant, which is a particularly stylish options for an outdoor living space. 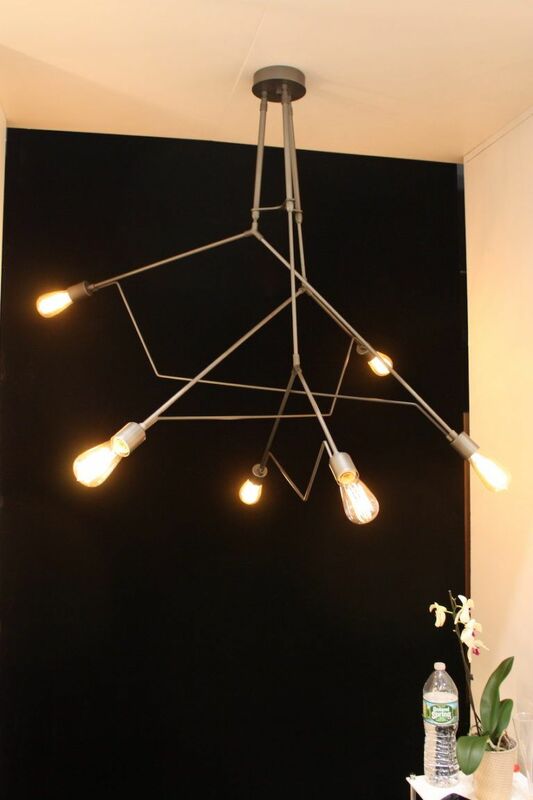 Not a typical outdoor fixture, this is modern and stylish. 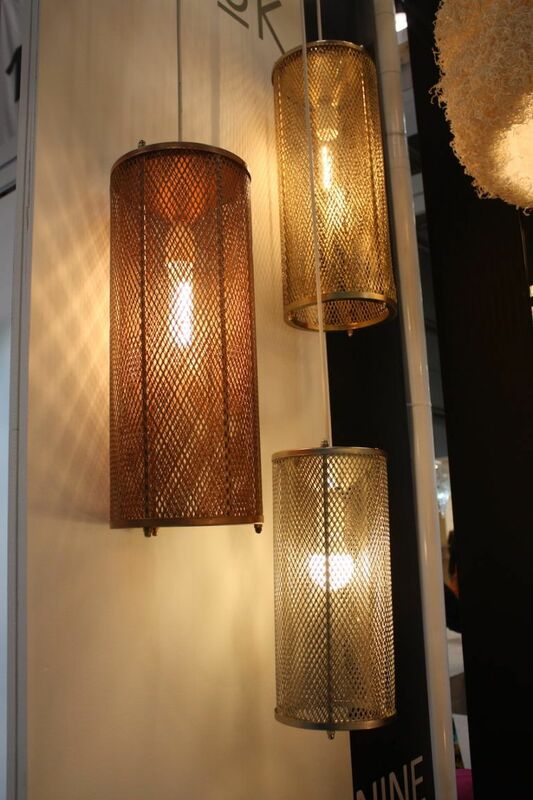 A sparkling diamond inside an industrial cage fixture is one of the attractive lights shown by Littman Brands. It has plenty of sparkle and shine, but is not too glitzy, tempered by the rustic frame. 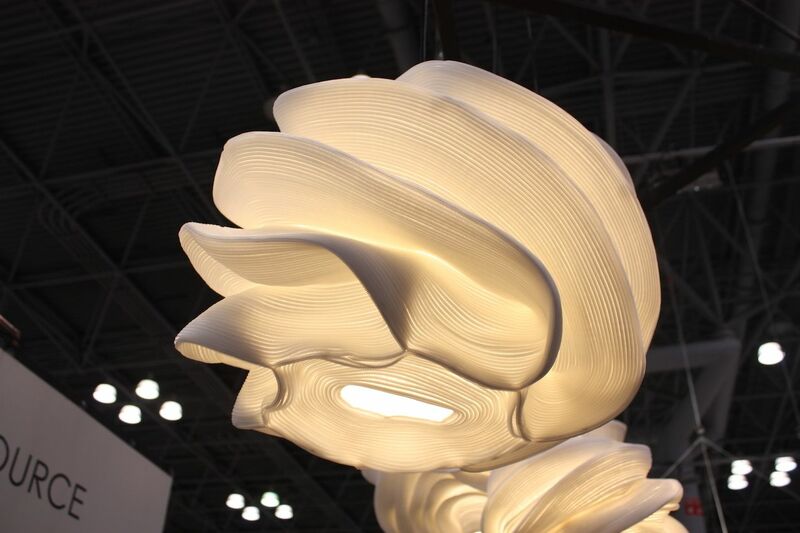 These curvy beauties are the TR-10 from Global Lighting. 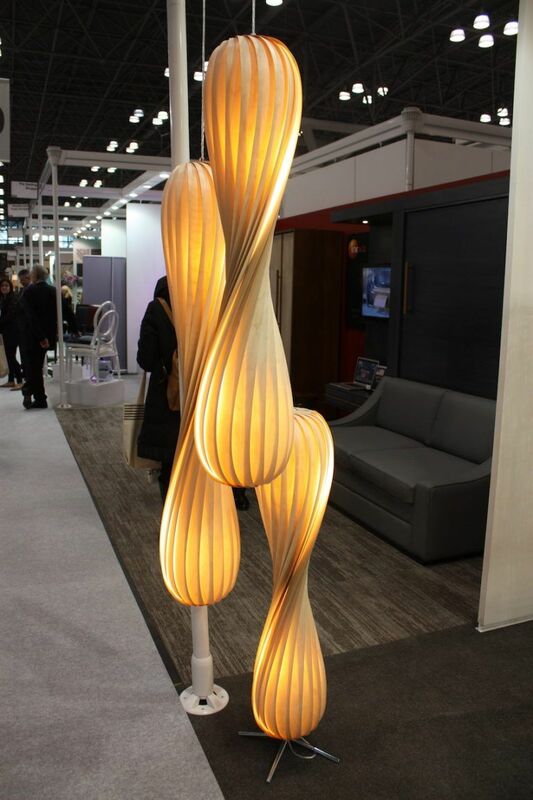 From the elegant rounds at the top and bottom to the wispy waistline, the paper-thin birch slats give the light a changeable nature. 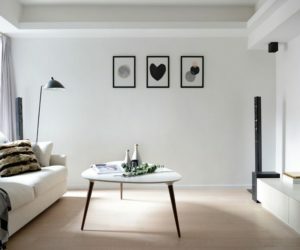 Available in a smaller size as well, it is was created by Danish designer Tom Rossau. The TR-10 also comes in white propylene as well as this birch version. 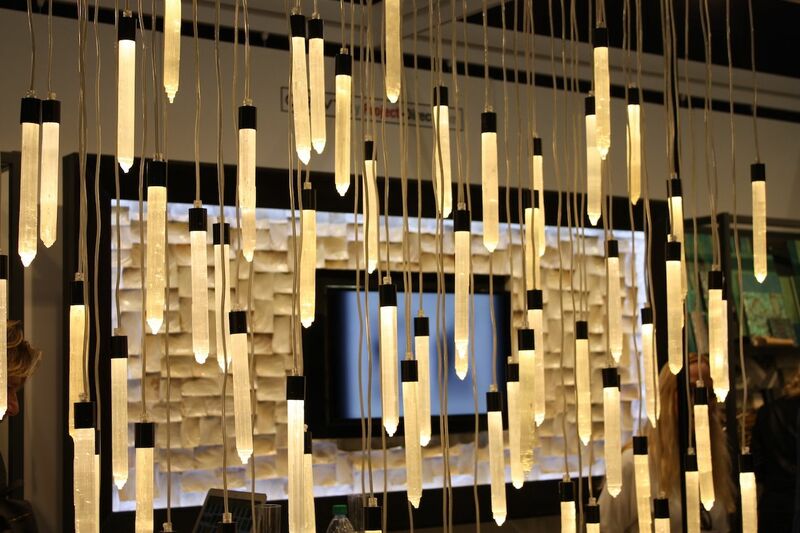 Would you believe that these long, elegant pendants lived a previous life as parts in a semi-trailer truck engine? 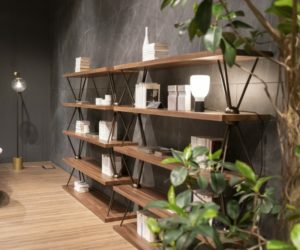 wakaNINE distributes products from designers “whose aesthetics blend nature and technology in modern forms.” We think this is a fantastic example of sustainability and high-end up cycling. Another unique line represents by wakaNINE is from Ango of Thailand. 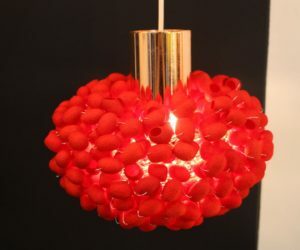 This is the Cherry Moon pendant, which is composed of silkworm cocoons. 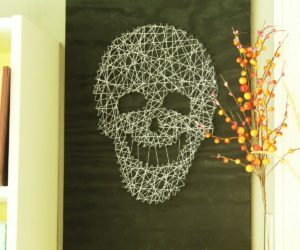 The company also works with rattan, mulberry tree bark and hand soldered wire in addition to silk worm cocoons. 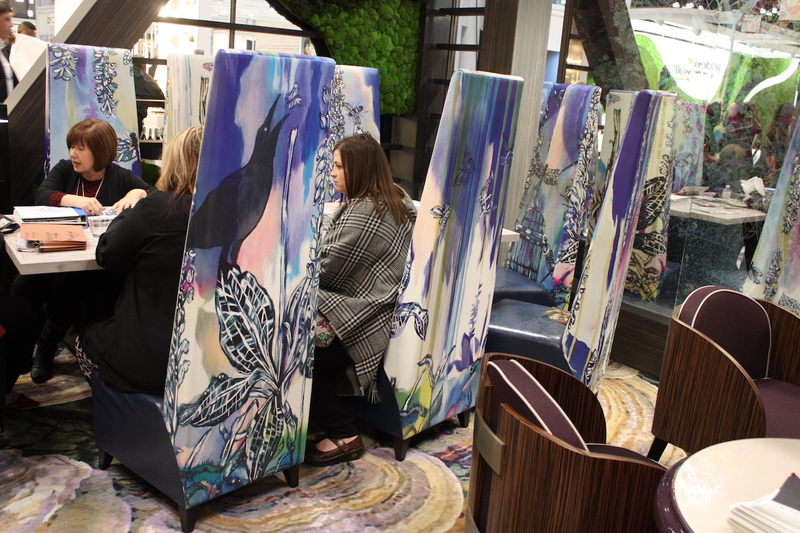 Renwil’s striking display was whimsical and such fun, featuring its Wonderland Collection. 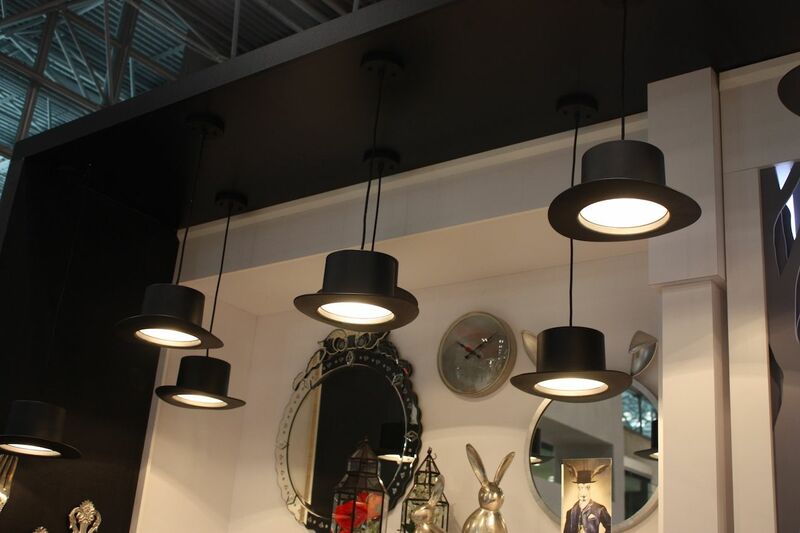 The Langley Pendant is fittingly fun and different, injecting a shot of masculinity in a lighthearted way. 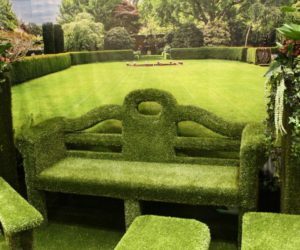 Speaking of whimsy, The Original Lawn Furniture Company presented a delightful collection of furniture that is made of polycarbonate and upholstered in anti-microbial, resilient soft polypropylene woven grass that is UV stabilized and guaranteed not to fade. 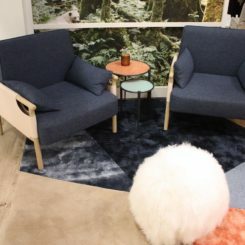 Really attractive — and amazingly comfortable — it is available as tables, chairs, benches and planters. 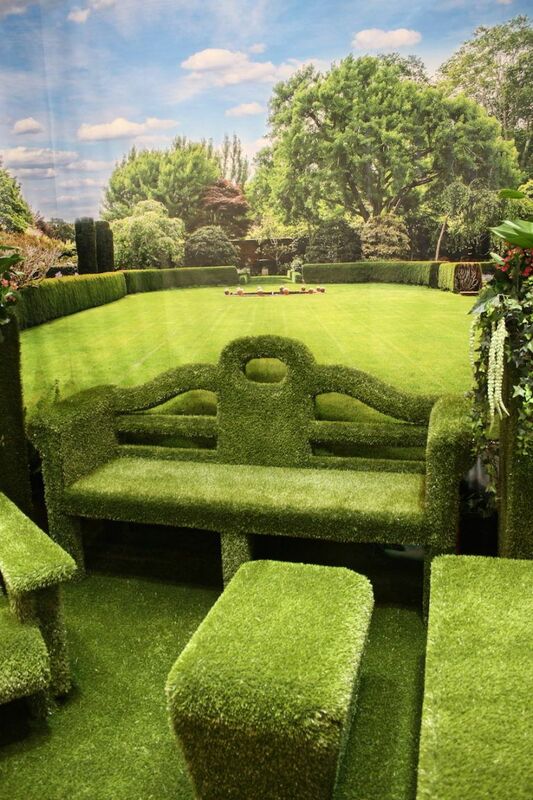 Designed by Charles Pavarini III, it’s enchanting! 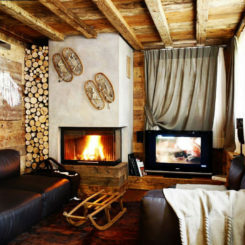 We couldn’t believe what we were seeing — a woman sticking her hand right into the fire! It has all the flickering charm of a real fire but it is not. It is the AquaFire, virtual flame, made of only water. 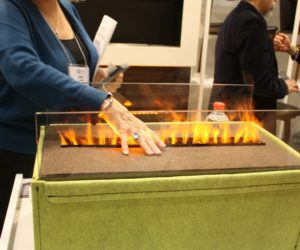 It’s an amazing and safe technology that’s perfect for indoors where a regular fireplace might not be safe or possible. 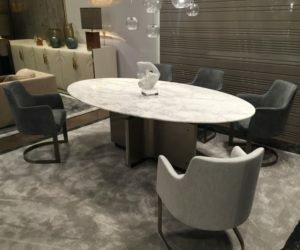 Maggi Massimo specializes in manufacturing Italian luxury country style furniture for the kitchen, tavern, living room, dining room and for home decor. This is their wine bar, which has an automated pouring system controlled through the phone buttons, and an automatic glass chiller. It’s a conversation piece as well as a first-class entertaining center. 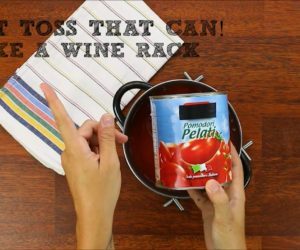 The bottom of the unit includes wine storage. Who wouldn’t want this fluffy marvel? 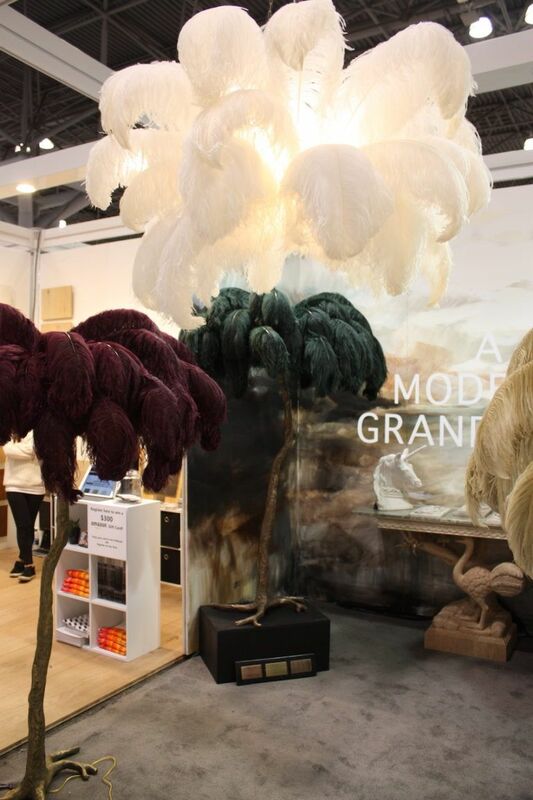 A Modern Grand Tour had a forest of ostrich feather palm trees in a range of hues. 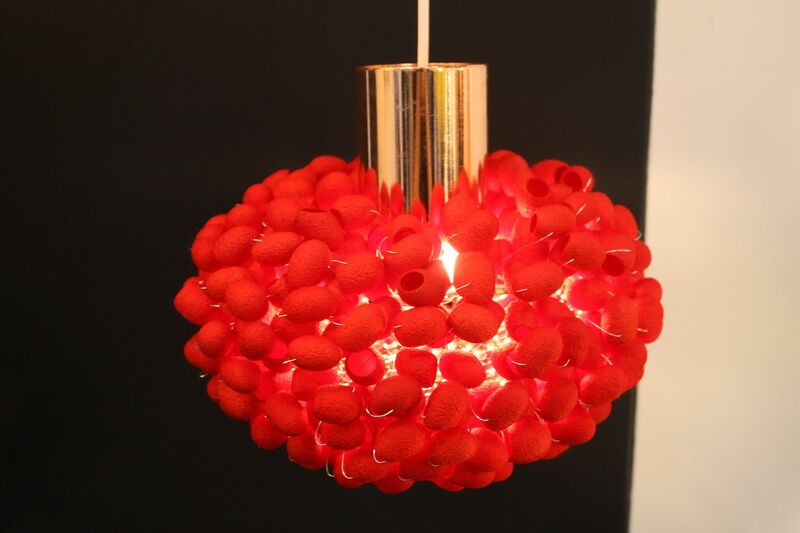 The hanging feather lamp is a pouf of elegance that would add elegance to a bathroom, bedroom or entertaining space. 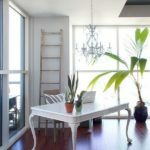 The feather palm tree is available in a range of luxurious colors. 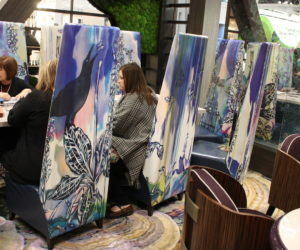 Marriott created a Midnight Garden display, featuring elements form a variety of designers, including Garden on The Wall, which created the lush green ceiling and moss wall displays. 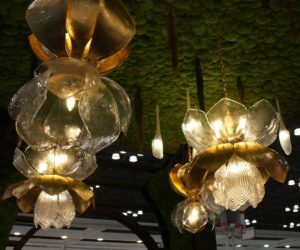 Spectacular blooms in glass and metal are suspended from the ceiling, lending a magical light to the area. 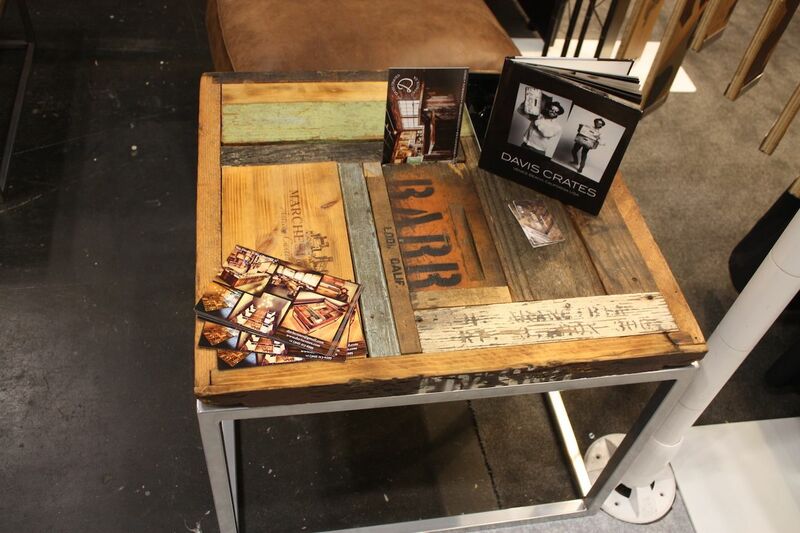 Reclaimed crates make for distinctive furniture pieces as created by Davis Crates. 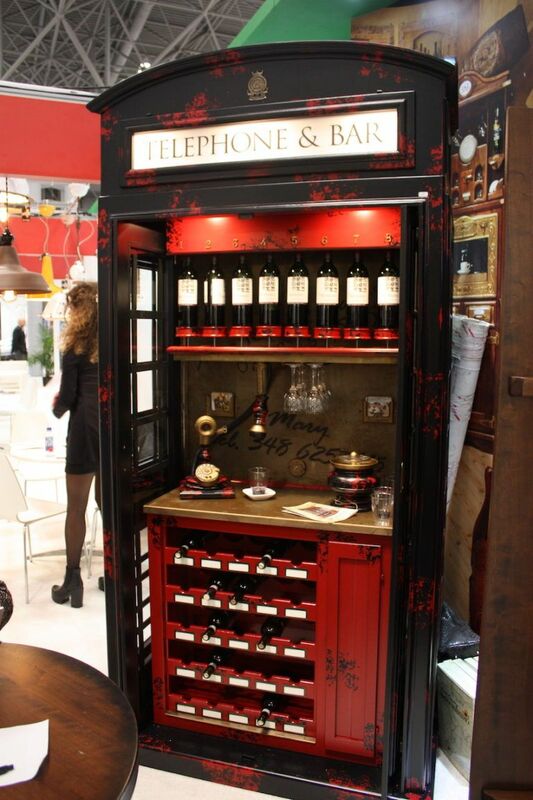 David Pilcer, originally from France, collects, preserves and refashions vintage wine crates. He started collecting them in France, and now does so in the California wine region. 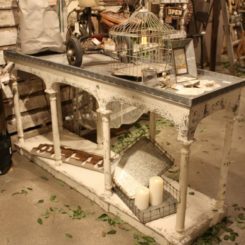 Tables, chests, and decor pieces are among his creations. 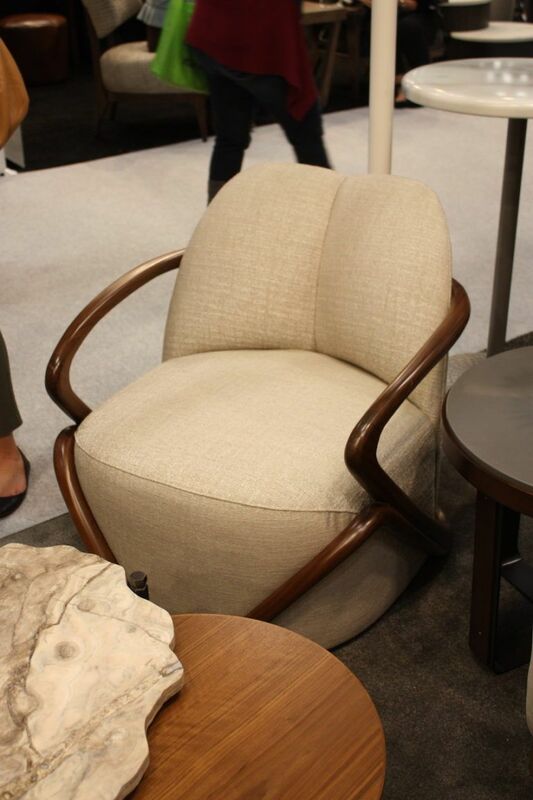 A stuffed and wood framed armchair has a unique frame that is elegant and unusual. 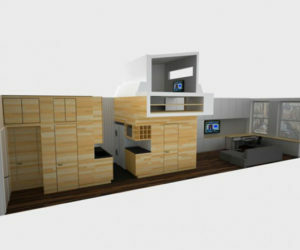 It is from Elements Contract Furniture. 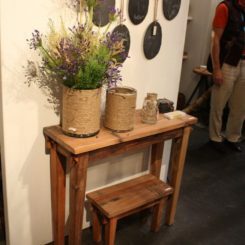 The wood and textile combination has a very natural feel. 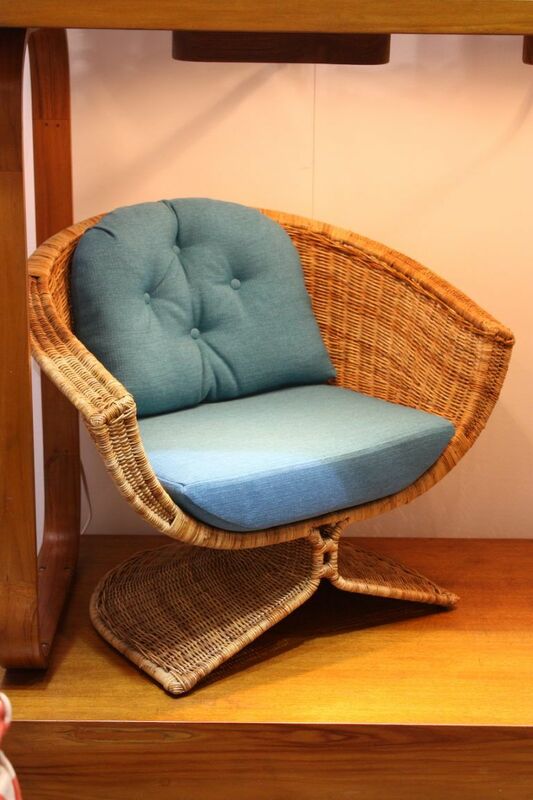 The elegant lines of the base on the Lotus Chair are very appealing. 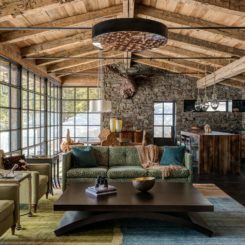 Designed by Miller Yee Fong circa 1968, it is significant because it marries modern form with “rustic materials,” indicative of the 1960’s California lifestyle. The Lotus is on permanent loan from the Fong Brothers to the Los Angeles County Museum of Art as part of their collection of classic designs from the mid-century. 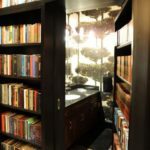 The Fong Brothers Company was founded in 1954, and has been creating fine residential and commercial furniture ever since. 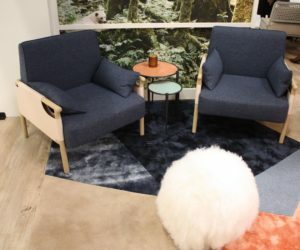 Brooklyn’s from the source also showed this funky sofa, which is cushy thanks to the padding, and a structural marvel underneath. 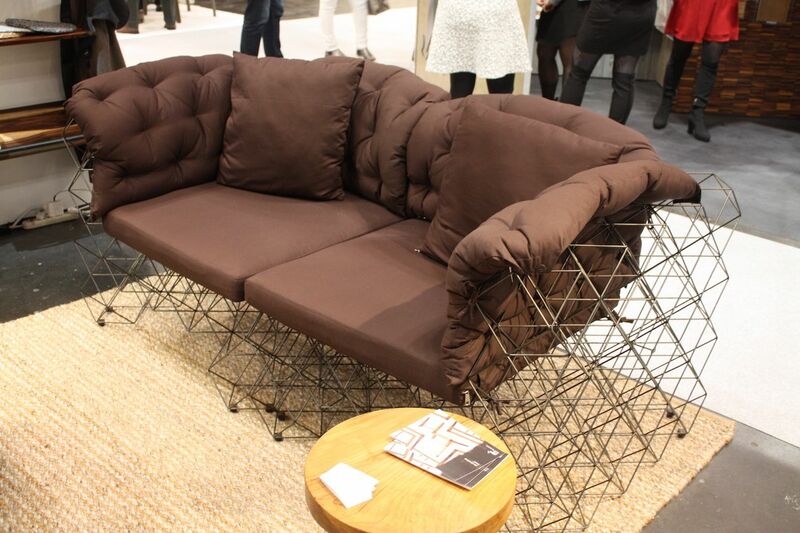 Such a delicate frame for a substantial sofa. 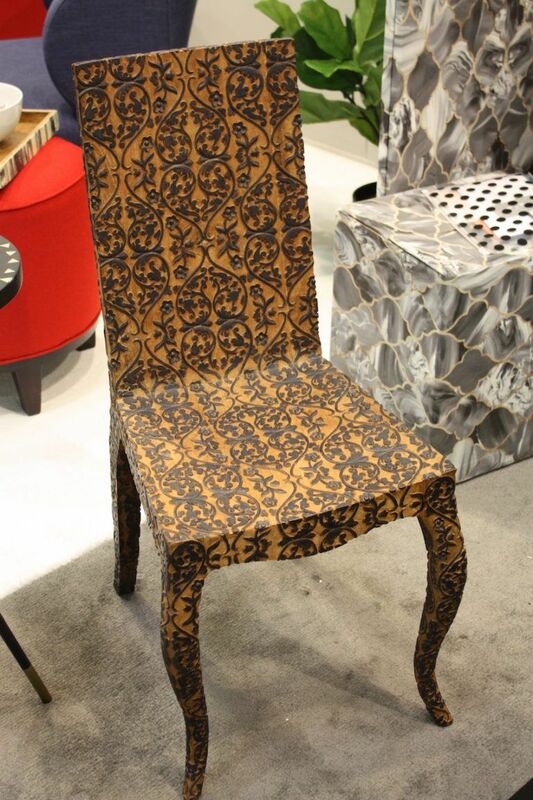 Geometria, whose works are produced by India’s premier and leading furniture house, showed this intricately carved wood chair, which would be a perfect accent for a living room or home office. 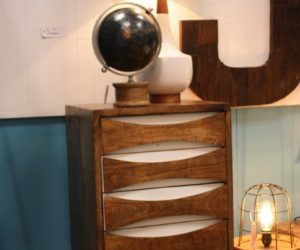 A line of new accessories from Go Home feature natural wood and vintage style pieces. The small tabletop chest is attractive and very function for hiding away small items. 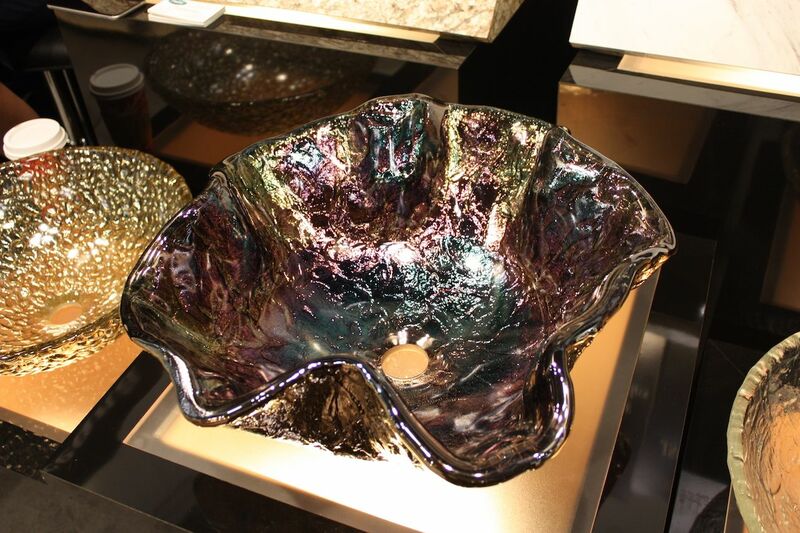 For a distinctive bathroom, the Alina Art Vessel from JSG Oceana would be a fantastic option. 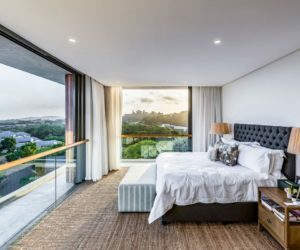 Beside being visually stunning, it is scratch, stain and thermal school resistant and made of shatterproof borosilicate glass. While this color is magnificent, there are many other finish options. 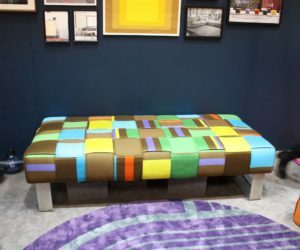 Designer Lucy Tupu’s colorful booth featured this large, comfortable bench. it is part of her ‘Flax’ collection, which is a contemporary spin on the traditional weaving techniques from her Samoan heritage. Instead of traditional materials, she uses Paul Smith plaids with bright hues. Moroso’s The Pipe, designed by Sebastian Herkner in 2015, has a minimalist frame that consists of a powder-painted aluminum tube. 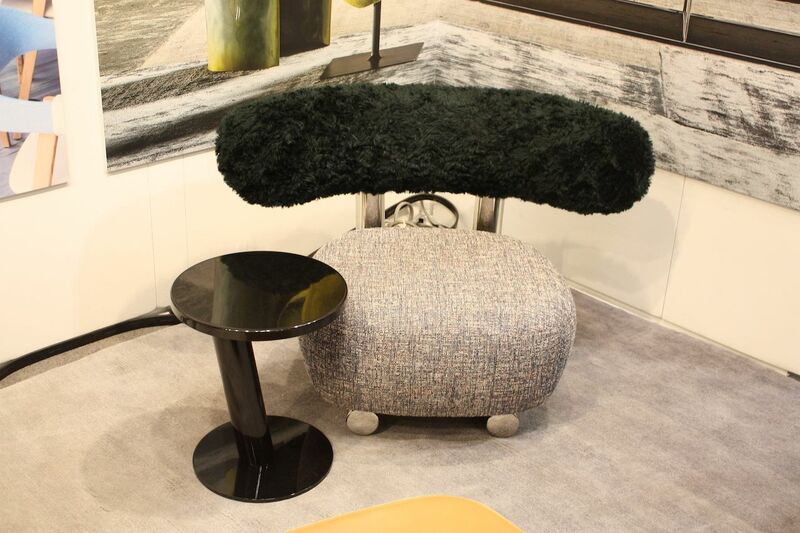 The different upholster textures and shapes of the back and seat agent the minimal design. The back is like a furry little arm, ready to embrace you. 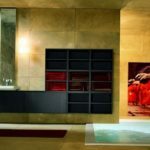 Adding texture to a wall as an accent or an entire surface treatment is an easy way to add drama and Novo Arts had plenty of ideas. 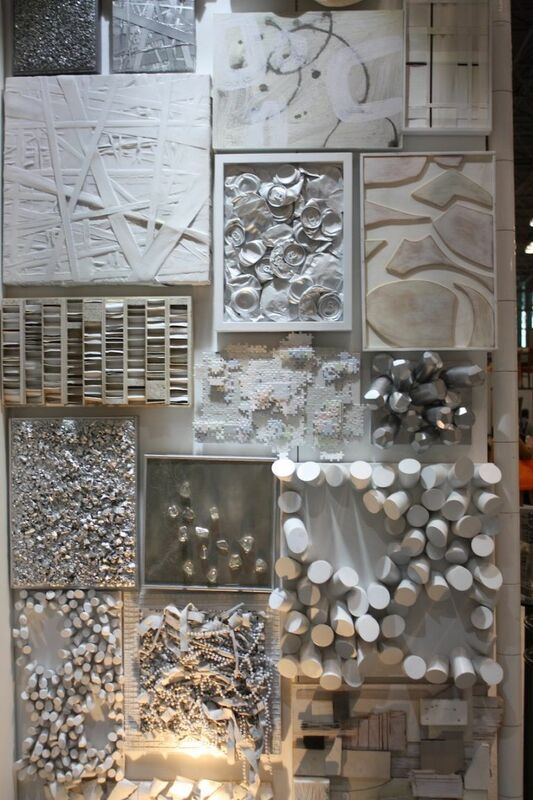 Their many examples of textures and colors spark the imagination for decor ideas! 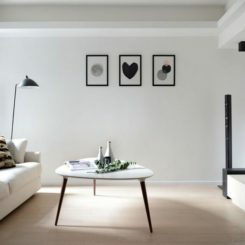 Collections, repetition and found materials take on a different look when painted white. 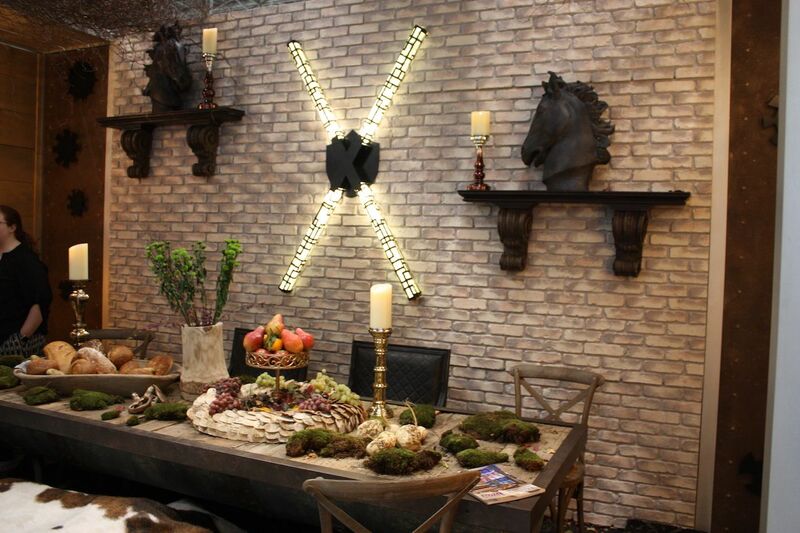 Royal Lighting channeled their inner warrior when they created his Game of Thrones-inspired display. 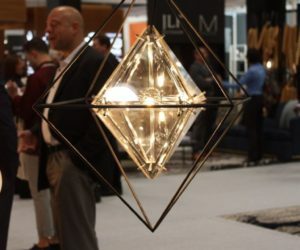 While most people are not looking for medieval decor, the light fixture is very cool and would be great in a number of settings. The rustic table setting is inspirational. 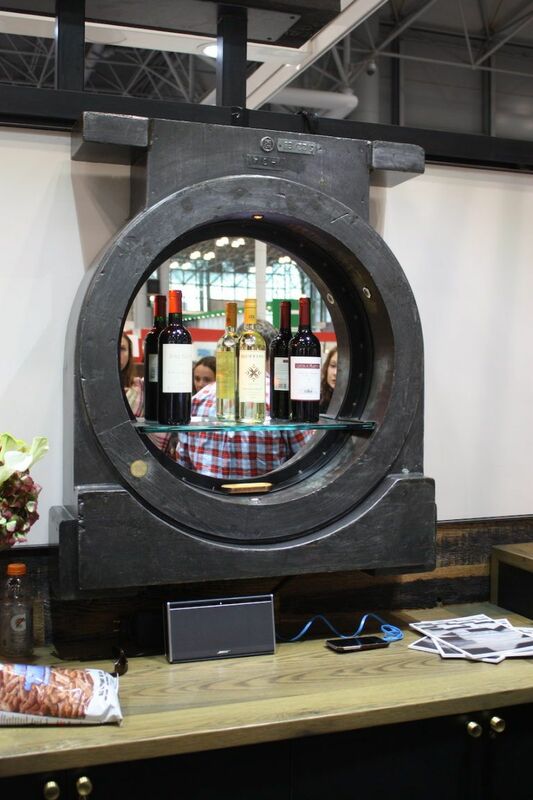 Rust Belt Reclamation works with restaurants and facilities, adding statement elements like this mirrored bar unit, which is fashioned from an industrial fitting. This is a fantastic example of imagination and ingenuity. 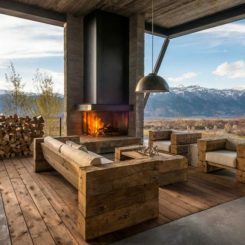 The core work of the business uses reclaimed wood. 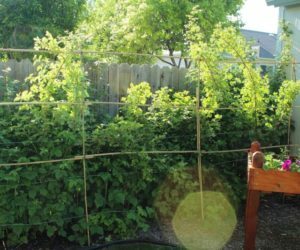 Just because you don’t have a green thumb doesn’t mean you can’t have vibrant displays of greenery and flowers. 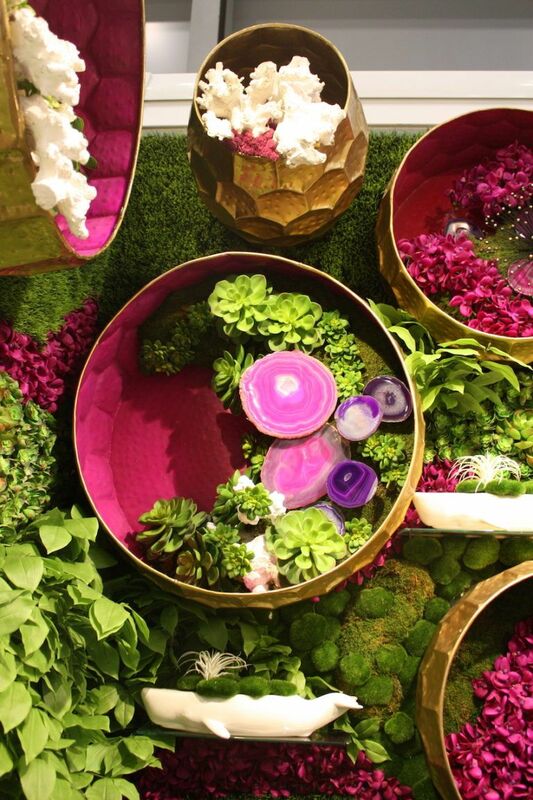 LDF Silk created a spectacular wall of vibrantly colored flowers and greenery, with accents and vases. Creativity and imagination can yield a colorful and distinctive silk display. Created in Indonesia, ViaMotif’s pieces are woven by local populations from sustainable materials. 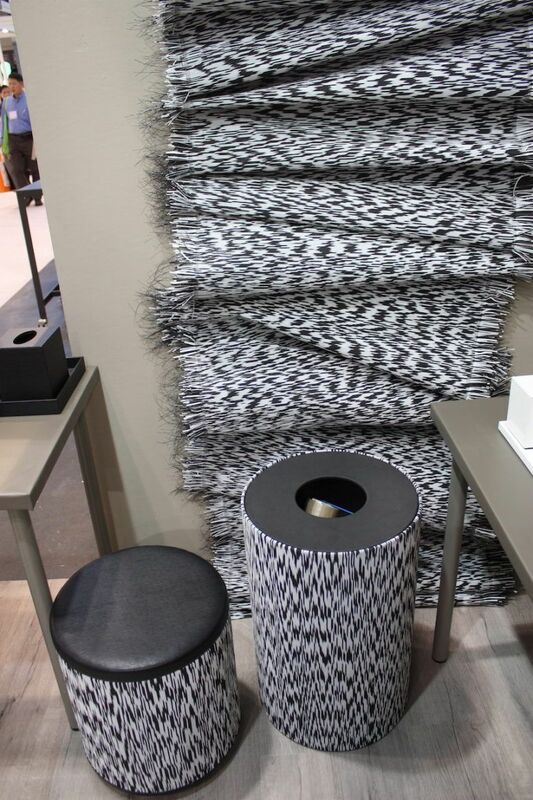 This example of the woven materials accompanied by the finished pieces shows the process. 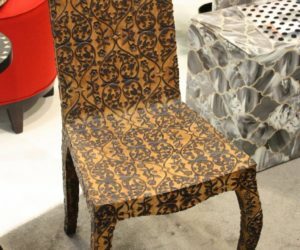 The company has produced distinctive pieces since 1990. These pieces are modern with an ethnic feel. 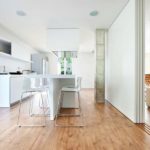 Plenty of inspiration here for your home! 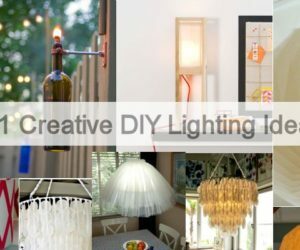 Try incorporating some of these ideas into your living space and see what an update it can be.